Taxi rides in Cuba are the closest to a time machine ride, hold on into the American muscle car from the 50's or earlier while you can. 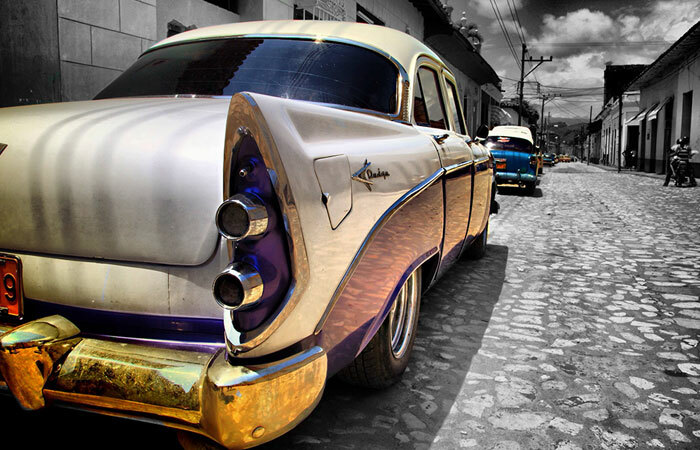 Detroit's motor glory in the Habana's streets as a experience is set to a possible extinction now that Obama has ordered full restoration of diplomatic communications with Cuba. via SIMON MARLOW © 2015 - ALL RIGHTS RESERVED. via A taxi in Cuba. To American eyes, it's a vintage model, but the picture was taken in 2009. Enjoy, as they likely won’t be around for much longer. A one of a kind taxi catch!! Fishing on Flicker's Taxi Picture Pool is fun. More than 12000 taxi pics from around the world. While looking around www.taxi-library.org I stumbled upon vintage ads from my Kalamazoo's favorite Child, the checker cab. In this picture: a rear vintage Checker Diesel Cab poster ad. If you know where I can see more like this let us know!! !